SAN FRANCISCO, CA--(Marketwire - June 5, 2007) - Just in time for summer, Metromint (www.metromint.com), the original mintwater, with the unique cooling sensation, now has four vibrant varieties to choose from: super cool Peppermint, subtle Spearmint, bright Lemonmint, and juicy Orangemint. Metromint doesn't just taste fresh, it feels fresh. Real mint stimulates the brain to open your senses and send cooling sensations throughout your body. Long after your first taste, the mint continues to invigorate. Metromint is the perfect way to beat the summer heat. All four mintwater varieties are made with pure water, and absolutely no sweeteners, preservatives, or calories. Nothing but all natural ingredients and a surprisingly vibrant taste. Whether you're looking for a way to kick your soda habit, reduce your calorie intake, or just long for a refreshing drink with just a little more oomph than plain water, Metromint provides hydration and keeps your cells happy so they (and you) can thrive. Prevention Magazine highlighted the anti-fatigue properties of Metromint in "How to finish your workout feeling fabulous." Weightwatchers.com recently dubbed Metromint "one of the top ten food trends to watch." MTV VJ and "Entertainment Tonight" correspondent Vanessa Mannillo included Metromint on her list in US Magazine as "one of the beauty essentials that she can't live without." Dr. Charles Stuart Platkin a.k.a. The Diet Detective refers to Metromint as a "Calorie Bargain" in his new book: "The Diet Detective's Countdown." Each variety of Metromint is designated with a numerical chill factor. From mildly cool Orangemint (-3) to super cool Peppermint (-9), the chill factor is a comparative scale that measures the range of minty refreshment. No matter which variety you choose, you'll experience all-natural refreshment with the cooling sensation only found in Metromint. taste that awakens your senses. orange grove in full bloom. Metromint stimulates the senses, soothes the stomach, and restores the mind. Exactly the kind of benefits you just can't get from plain old bottled water. And exactly why style- and health-conscious consumers are drinking Metromint. Mint stimulates the brain, while sending cooling sensations throughout the body. The natural menthol in Metromint freshens the breath and can clear congestion related to colds and allergies. Enjoyed before a meal, mint increases the flow of digestive juices. After dinner, it soothes the lining of the digestive tract. Pregnant women with upset stomachs and morning sickness report Metromint's calming, all-natural benefits. Metromint is the brainchild of Rio Miura and Scott Lowe. Born in Japan, with a background in product and fashion design, Miura conceived the recipe for Metromint and designed the packaging. Lowe, a Stanford graduate with a degree in International Relations, is responsible for product development and oversees operations. Together they run Soma Beverage Company, LLC., a small group dedicated to making great-tasting beverages that combine the purest ingredients with innovative packaging and extraordinary taste. Metromint has single-handedly created a new beverage category called mintwater, which combines the properties of functional and flavored water. 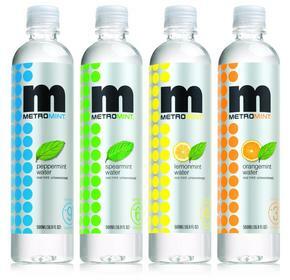 Metromint is also quickly gaining popularity in the enhanced and premium bottled water categories. Metromint continues to win accolades from national media including U.S. News & World Report, Real Simple, Self, "The Today Show," CNBC and the Food Network. Metromint Peppermint was introduced at the New York Fancy Food Show in July 2004 and won a "Best of 2004" new product award from Bevnet.com. Metromint Spearmint was introduced in March 2006 at the Natural Products Expo West, won a Best New Beverage Award and received a 4-Star rating from BevNet. Watch for Metromint on the Food Network's "Unwrapped," airing in August 2007. Look for all four Metromint varieties at the Fancy Food Show in New York, July 2007. Metromint Peppermint, Spearmint, Orangemint and Lemonmint are available in 500 ml PET bottles for $1.39-$1.69 (Retail). Metromint has a loyal following among discriminating consumers and is available in stores nationwide including Whole Foods Market, Wild Oats, Safeway Naturals and numerous other natural, specialty, and grocery markets. For more information, visit www.metromint.com.